Due to my feeble lack of self-control when it comes to the weekend and writing, I’m afraid my planned paean to Led Zeppelin II will not be forthcoming this week. Apologies to one and all; hopefully this wonderful storm of old-school rocking will more than suffice until Plant and co’s second classic rambles onto some sort of sense in my deliriously fanboyish thoughts. Graveyard, made up of four hairy Mikael Åkerfeldt clones from Gothenburg, Sweden, play a form of 70s worship that takes in both the mighty Zep and Deep Purple, as well as everyone from Black Sabbath to Cream to Hawkwind to MC5, let alone multiple psychedelic and bluesy crews that you’ve never heard of to create a professional whole. Being blunt, they sound fantastic. My worship for the seventies as the golden age of music is well-known, and I have enough trouble getting around the fact that so many wonderful masterpieces were created in that decade without having to fathom this, created in 2011 and kicking colossal amounts of arse from the first moment I put it on until now. Where to begin? The sweet strains of Ain’t Fit To Live Here, smoothly switching from outrageous crotch-thrusting to gospel-esque humming? The intense and emotional Uncomfortably Numb, complete with outrageously brilliant solo? The Spaghetti-western whistling of Longing? Wherever you look, you’re confronted by awesomeness, calmly taking your shaking hand and leading you onto the dancefloor to boogie on down. Not only are Graveyard naturals at this sound, they’re natural songwriters, ensuring that each cut does its job of rocking the hell out and giving the listener the best time possible. Comparing them to countrymen Witchcraft is automatic yet a little unfair – Graveyard veer away from their fellow countrymen’s more purist Sabbath-worship towards something of an all-encompassing sound. They’re quite capable of Doomy thud when called for; the deep twanging of Ungrateful Are The Dead has a notable stoner slant, for example, and parts of No Good Mr Holden has caused sightings of Iommi’s ghost in several individuals of nervous disposition. 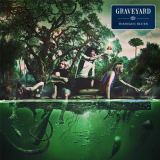 Yet in general, Graveyard head for the high-pitched rock god freak-outs, vocalist Joakim Nilsson having excellent range and being capable of hitting the top notes as well as the more regular crooning that takes a band of this nature from good to great. He and fellow guitarist Jonathan Ramm produce a tidal wave of wonderful licks that will bring Hendrix to mind at times, thick and creamy guitar tones in a wonderful surge of melody. So good is it that you won't release the general lack of keyboards at first, not that I'm really complaining. If there’s a serious fault here, it’s that the nine songs present work better as individual snapshots of a past era than as one whole album. When I think of this album, it’s as a collection of moments rather than a single rip-roaring thrill ride. I suppose the difference between Graveyard and their influences is the sense of urgency that you get here – where a vintage band would be content to meander a fair deal in the course of forty minutes, these boys pack each second full of sound, being sure each note serves a purpose. Nothing is left to slack, nothing is left for the listener to fathom in their own time and their own way, one of the things I like so much about the oldies. The result here is that Hisingen Blues can feel slightly lacking, as after so many hills you’re left waiting for valleys that don’t appear – the aforementioned Uncomfortably Numb and Longing amongst the best tracks on the album for me for that very reason. Yet never do you get the impression that Graveyard belong in a pigeonhole with hipster music-for-adverts-creators like Wolfmother – place them instead with classic progsters Bigelf in a genre all of their own. Both are tributes of genuine quality that don’t steal from the past so much as use that sound in original and enjoyable ways; you can’t hear the title track here and not be intrigued by the expert intensity that piledrives on with riff upon riff and melody upon melody. These two bands are pretty unique in having their own sound but being completely indistinguishable from their classic peers – Hisingen Blues especially could have been released decades ago and still sounded completely natural. That’s the ultimate mark of quality, I suppose; not that you’ll be asking for one after hearing Graveyard.